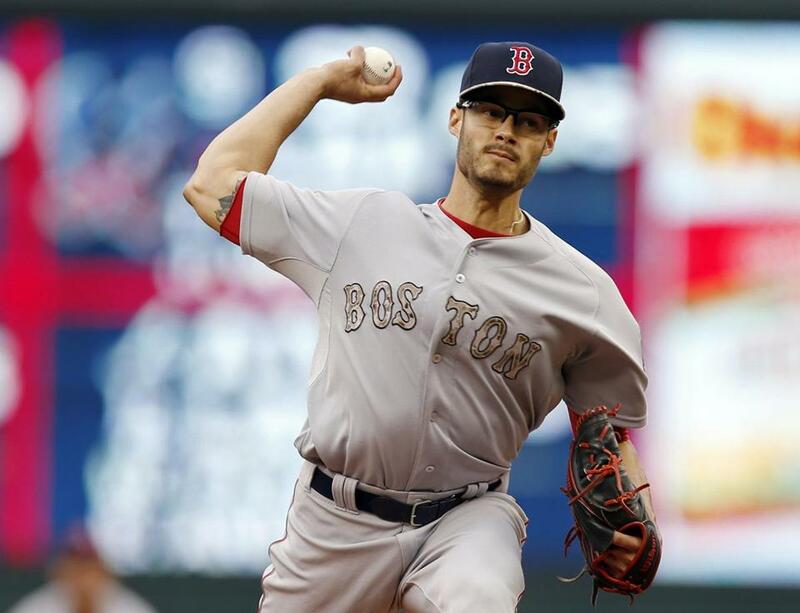 Ask Nick: What should Red Sox do with Joe Kelly? Joe Kelly lasted less than two innings in the Red Sox&apos; loss on Monday. As you will see from the questions and responses in this edition of the mailbag, there is a lot of concern about where this Red Sox team is and whether it is going anywhere. The only constant has been inconsistency. There hasn't been that cohesiveness on the field that there was in 2013, even though they seem to be close off the field. I mentioned in my most recent column how they may miss Jon Lester in more ways than we could have imagined. We were all focusing on his on-field contributions, but he also had a toughness about him that resonated on the team. The later it gets, the more we wonder whether the team can put it together. It's certainly not too late. They need to get on a roll like the Texas Rangers recently did where they rattled off six straight wins and completely changed their mindset and attitudes. The Red Sox have been saved by the poor play of their AL East opponents. It’s time for the most impressive players to be the everyday players and the high-priced starting pitchers. But in the coming weeks, general manager Ben Cherington is going to have to assess whether 1.) he needs an ace; 2.) should he shake up the lineup by adding another big bat, especially if David Ortiz continues to struggle? It all comes down to giving up prospects to make changes. That's a fact of life. If you think you're good enough to go for it, then you give up what you need to give up. One of the problems the Red Sox face is that some of their prospects, once considered desirable by teams, have fallen off a bit. Devin Marrero, Brian Johnson, Eduardo Rodriguez, Manuel Margot, and Rafael Devers have high value still, but there's a dropoff after that. Yoan Moncada is untouchable and in a league of his own. While Greenville has good talent, it's hard to really evaluate players that young. "Not as much there as you would think," said one National League scout who recently toured the Sox system. It seems the Astros, Cubs, and Twins have more sought-after prospects (at least that's the reaction we're getting from scouts around the game) even though the Red Sox remain in that upper echelon of farm systems. We'll see if this hurts the Red Sox in trade discussions if and when they're ready to deal. It's one thing for a starting pitcher to have an ERA over 5.00 or 6.00 and still be able to last at least five or six innings, spreading the damage around some, vs. getting shelled in the first three or four innings, or even sooner like Joe Kelly on Sunday vs. the Twins. We're not even into June and this has happened about a half-dozen times this year. When it does, we hear the usual excuses – not locating the fastball well, leaving a slider over the plate, pitches not breaking down, arm slots off. Blah, blah. What really is going on here? I think those things are the culprit, but why are they occurring? They fired the pitching coach, Juan Nieves, and then there was a sudden jump in performance, but lately both Rick Porcello and Joe Kelly have stumbled. We can't expect a quality start every time out, but for me it's always on the pitcher. Kelly and Porcello are both 26, but Porcello has a lot of experience and is supposed to be the ace of this staff. Kelly is less experienced and is still very enamored with the radar gun, which he no doubt lights up. Sometimes the command isn't there. They've been trying to get him to take the foot off the gas pedal a little. Just when you think it's safe to contemplate the Red Sox are turning their season around, they put in an inept performance against the Twins and you realize this is just 2014 Part Deux. I'd say it's time Big Papi started to go to the left side instead of continually challenging the shift. I'd also say it's time to send Joe Kelly to the pen or even Pawtucket if he has options. I'm sure they're thinking about sending Kelly to the bullpen at this point, but I just don't think they'll do it just yet. Just a hunch on my part. Matt Barnes might be the logical fill-in, but John Farrell said they weren't trying to stretch him out when he pitched 3 1/3 innings in relief of Kelly on Monday. Eduardo Rodriguez seems the logical call-up. With Kelly's recent struggles, is there any chance the Red Sox demote him and call up Eduardo Rodriguez? If Kelly is demoted, could he return in the bullpen? Sasha, New Smyrna Beach, Fl. Yes, this would be the move. Rodriguez has been the most consistent starter in Pawtucket. The criticism of him by scouts is that he doesn't have an effective curveball to play off of his hard stuff to keep major league hitters off balance. Kelly, with his high velocity, is intriguing out of the pen. How significant is it that the Sox get road games in Texas out of the way in May? Is there any real significance in the fact that 63 out of the Sox' last 69 games will be played in the Eastern time zone, with the outliers being just six games in the central time zone? I'm not a big believer in scheduling issues. Every team has their own challenges with the schedule, so for me it's a excuse. I will say that teams in the extreme East (Boston) and extreme West (Seattle) usually have the toughest road because they log so many miles more than others. For me its more how those teams are playing when they meet. Texas is hot right now. They've won six straight and Boston had a tough time against the Rangers at Fenway last week. It seems Mookie Betts is proving to be another failed attempt to prematurely promote an unproven minor league player. Am I the only one who thinks Brock Holt should be leading off and playing center field? Brock Holt has had his challenges as well. He recently went through bad slump. Betts' batting average doesn't reflect how well he's hit the ball. His outs are pretty hard. I don't think you're seeing a lot of swings and misses. Cherington agreed that Mookie's hit into a lot of bad luck, so no, I wouldn't replace him with Holt, who really is a utility player. Everyone is trying to thrust Holt into a starting role, but I don't think he's suited for that. Do you see ownership making changes with Ben Cherington and John Farrell if the Red Sox' poor performance continues? My gut reaction is no, I don't think either Farrell and Cherington are going anywhere. They are very popular with the ownership. They both have received multi-year contract extensions. Of course, if the frustration continues the entire season, who knows? There comes a breaking point for everyone. I'm more of the mind to say the players need to take responsibility for their own production. We're talking guys making millions and millions of dollars. You can't blame everything on the manager and GM. The Red Sox were quick to change pitching coaches in hopes of reviving the rotation. It seems now that they should look at hitting coach Chili Davis. No to this as well. Davis will continue as hitting coach. He has a multi-year deal and they'll give him time. In a recent column I wrote on Davis, you'll see how accountable he is even though it's really up to the hitters. Davis can't hit for them. It sounds like he makes plenty of suggestions. Why not try Hanley Ramirez at first base? It would probably cut down on his injuries and open a spot for Rusney Castillo. They could platoon Ortiz and Mike Napoli at DH. The reason you mentioned is the reason you wouldn't do it. He's had a lot of injuries, and has devoted an entire winter, spring training, and early season to learning left field. He would have to do a lot of extra work to learn first base. And his physical situation wouldn't allow him to do that right now. And if David Ortiz is platooning, you're in a lot of trouble. You have to hope he comes out of his slump and starts hitting. If he doesn't, this team is in a lot of trouble. Why do you think the Red Sox are so unwilling to commit to a proper pitching staff with at least two front-line aces? I always thought they needed one ace. Not sure about two. I think if you get that one guy, that leader, that stopper at the front of the rotation, it takes the pressure off everyone else. Cole Hamels has been pitching outstanding. He would have been the guy – a lefty – a proven commodity who has been a World Series MVP. The Red Sox seem to have no prospects at Portland. Will this wind up catching up to the Red Sox at some point? I would guess there might be a little bit of a gap for a year or so as Rafael Devers and Manuel Margot start to move up in the organization. I will say scouts think righty reliever Pat Light (29 Ks in 23 inning) is going to help the Sox soon. Blake Swihart has struggled at the plate since coming up. Do you still think he's going to be an All-Star catcher? Yes I do. He's done a very good job defensively. He's handled the pitching staff well, blocked balls, thrown well, and looks very athletic. His hitting will come along as he gets to know the league better. He's continuing his development in the major leagues and that can be both good and bad. So he's going to struggle at times in both phases of the game. You have to be real patient with him, but I hear no complaints about him whatsoever. It's been such a frustrating year. I thought the Red Sox were going to be good. What's happened? Have an hour? No real team identity yet. Have no idea what they are. The new players haven't asserted themselves like the new guys in 2013. Those guys had great character and came together naturally. Not saying that the new guys don't have character, because they seem close off the field, but it's just not cohesive on the field. I really believe it centers around David Ortiz. I think as he goes, so goes the offense. Have a question for the next Ask Nick Red Sox Mailbag? Submit it here.